The Milnor Continuous Batch Washer Systems (CBW) are an excellent solution for on-premises laundries, including those in industries like hospitality, linen supply, healthcare and more. With exclusive PulseFlow® Technology, users gain top performance and efficiency for every size and type of load. As a factory authorized distributor of Milnor commercial laundry equipment, Martin-Ray Systems provides CBW systems throughout the Rocky Mountain Region, including Colorado, New Mexico, eastern Wyoming and west Texas. By combining Milnor’s True Top Transfer with a controlled intermittent counterflow and a standing bath, chemicals are able to do the work needed without being diluted too soon, then receiving high-velocity PulseFlow which uses less water with better rinsing action. Aside from customized programming and monitoring, the processes behind the technology are an example of unique innovation allowing for a variety of resource and money-saving advantages. Martin-Ray Laundry Systems' representatives are authorized dealers with experience and knowledge on Milnor washer systems including Continuous Batch Washer Systems and PulseFlow® Technology. You can rest assured that any questions or concerns you have will be answered and addressed by one of our team members. 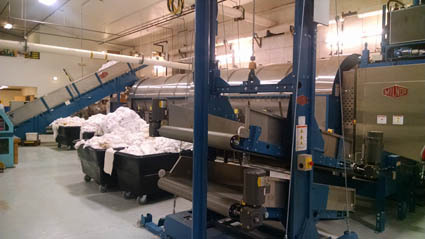 Contact us to learn more about how Martin-Ray Laundry Systems can help you utilize Milnor washer systems for your laundry facility.